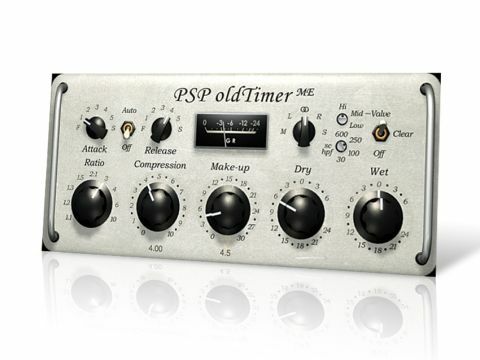 PSP has resisted tinkering with oldTimer's winning sound and instead expanded its functionality. Result! Excellent value. Very versatile. Brilliant sound. No latency and low CPU hit. Includes standard and ME versions. No external sidechain. Not as well suited to dance mastering. The original oldTimer was a hugely impressive plug-in, and we've come to value its warm, versatile sound and brilliantly simple setup more and more as we've continued using it. That plug-in offered just Ratio, Time, Compression (ie, threshold) and Output knobs, with switchable Valve and Clear modes, but PSP has just updated it with two tiny additional knobs: one to adjust the release time in relation to the attack time, and one to set the valve saturation amount. Still, there's no getting away from the fact that oldTimer has a very basic feature-set, and sometimes more is required. With that in mind, PSP have created oldTimer ME, which comes packaged with the original plug-in (so you get both for the same price, or for free if you already own oldTimer). The ME version offers up the same distinctive tone but with a much more comprehensive set of controls. oldTimer ME brings us proper independent attack and release settings, bypassable automatic release (the standard oldTimer has this permanently engaged), a valve saturation level control, left-right/mid-side processing modes, adjustable sidechain high-pass frequency, and dry and wet level knobs for dialling in parallel compression. The mid-side option gives you the ability to manipulate the stereo field. For example, to enhance the sense of stereo in a mixdown, you can apply compression to the sides, while to focus dialogue/vocals and give greater punch, you can use it on the mid channel. You can also, of course, run two instances of it in series to treat both mid and side. You can also process left and right independently in a similar way, though this is less useful (it does facilitate stereo unlinked processing, but using two instances for this seems like a hassle). The adjustable high-pass filter in the sidechain is most useful, allowing you to exclude bass frequencies from triggering the compression. However, with so many other options added, the continued lack of an external sidechain source option seems odd. PSP tells us they're considering adding this in a future version. The remaining controls are pretty self explanatory, but no less welcome. One thing we like is that many of the knobs have notched settings, like the kind of classic hardware that inspired oldTimer - this encourages confident setup and a minimum of fiddling while still offering wide sonic scope. Both oldTimers are zero-latency and easy on the CPU, so you could realistically use them on every channel in your mix, and even while recording. One of oldTimer's main characteristics is its old-school valve sound, designed specifically to gently colour the sound in a warming, pleasing way. As with many PSP plug-ins, it's won plaudits from many engineering legends for doing just that. Valve gear can have a smoothing effect on prominent, sharp transients, so oldTimer ME offers up a small Intensity dial, enabling you to reduce or increase the valve effect by shifting its saturation point. You might reduce the valve intensity when processing drums or for mastering complete tracks, where it can be important to preserve transients; conversely, if you're dealing with overly spiky percussion, you could crank the knob to round it off. The Clear option disables valve emulation entirely. If you choose to use it, the compression algorithm still offers its own colouration, so you won't be left with a sterile sound by any means. So what would you use oldTimer ME for? Well, its warm sound and generous feature-set make this plug-in suitable for everything from parallel compression and vocal processing to mastering. If you're looking to compress signals hard while retaining maximum transient snap and sharpness, though, it's not really designed for that; but producers of even the hardest dance music will appreciate its phattening qualities on synths, basslines and vocals. Meanwhile, the original oldTimer remains a modern classic thanks to its great calibration and winning sound. As a team, they deserve to be in anybody's virtual rack. Now listen to our audio demos - in which Rob Papen's new virtual drum machine Punch has been run through oldTimer ME.